The surge of fake news during the heated election season and the attacks from President Trump and his aides should spark re-dedication among journalists to the Society of Professional Journalists’ Code of Ethics: seek truth and report it, minimize harm, act independently, and be accountable and transparent. The assertions of “alternative facts” have also triggered a wave of re-evaluating what truth and fairness in journalism should look like. In a series titled “Challenges to Journalism,” the University of Kentucky’s School of Journalism and Media is exploring those issues weekly, with the help of the Bluegrass and UK Campus chapters of SPJ, and other units of the university’s College of Communication and Information. 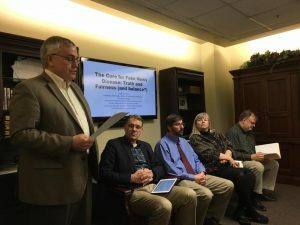 After an initial discussion by campus chapter co-advisers Al Cross and Dr. Mike Farrell, moderated by professor Scoobie Ryan on Feb. 9, the school hosted a panel discussion titled “The Cure for Fake News Disease: Truth and Fairness (and Balance? ), with two of Kentucky’s most accomplished political journalists; a university faculty member who has been a newspaper editor; and a conservative critic of Kentucky news outlets. The panel started its discussion by watching Kentucky Gov. Matt Bevin’s recent Facebook Live attack on The Courier-Journal of Louisville and longtime reporter Deborah Yetter. C-J columnist and former political writer Joseph Gerth said the story was accurate, but media critic Richard Nelson of the Commonwealth Policy Center said Yetter’s statement that the state attorney general is “defending” a new anti-abortion law failed to note that Beshear had not defended the law against a motion for an injunction against it. Cross countered, “You can also argue that including that in every story is being too tendentious, that you’re trying to make an argument for people who don’t like the bill.” He said those are the kinds of decisions that reporters and editors must make every day. Other panelists mentioned accuracy, in-depth reporting, and making sure that stories are important to the public. Cross said anonymous sources should be used only if a story is important enough and they are the only way to include essential information. Have the concepts of fairness and balance changed in recent years, or do they need to change? “Yes” was Gerth’s immediate answer. “The standards of verification are a lot more strict than they are now than they were fifty, sixty, seventy years ago,” he said. “What we’re seeing now is a night-and-day difference.” He cited The Courier-Journal, where he has worked for 29 years, as an example. Nelson argued that the concepts of fairness and balance have changed because of how divided we are as a culture. “The disconnect is that when there are people in rural America that are pro-life or value religious freedom, and their thoughts may be different from somebody else’s in a city, when that’s not covered fairly, they’re feeling disenfranchised,” he said. This has changed the standard of media outlets, he continued. “I think that’s dangerous for us as a people when you have such divided news sources,” that are not being objective and covering stories fairly, he said. A panel of local, regional and national professionals will examine the role of the news media and provide a better public understanding of how it works. The group also hopes to facilitate ongoing conversations about the importance of a free press in a democracy. The event will be held from 6:30 to 8 p.m. in Room A of the Central Library, 140 E. Main St., Lexington. Panelists will include Ryan Craig, publisher of the weekly Todd County Standard and president of the Kentucky Press Association; Tom Eblen, columnist and former managing editor of the Herald-Leader; Campbell Robertson, a national correspondent for The New York Times; Kathy Stone, assistant news director at Lexington’s WLEX-18; and Jim Waters, president of the Bluegrass Institute for Public Policy Solutions, a free-market think tank, and frequent media critic. Moderating will be Ginny Whitehouse, Ph.D., a journalism professor at Eastern Kentucky University specializing in media literacy, ethics and law. In early March the Media Arts and Studies faculty of the School of Journalism and Media and UK librarians will discuss the technology of fake news and how to expose it. On March 8, the journalism school will host Tom Rosenstiel of the American Press Institute, co-author of The Elements of Journalism, for a lecture at 3 p.m. in the Great Hall of the Margaret I. King Library in Central Campus. In late March or early April, SPJ Ethics Committee Chair Andrew Seaman will visit. In addition to the school and the SPJ chapters, the “Challenges to Journalism” series is co-sponsored by the school’s Scripps Howard First Amendment Center and Institute for Rural Journalism and Community Issues, and by the Department of Communication in UK’s College of Communication and Information. Al Cross, left, co-adviser for the University of Kentucky SPJ chapter, says the growth of social media and partisan media have contributed to fake news disease. You are currently browsing the Region 5 Blog blog archives for February, 2017.